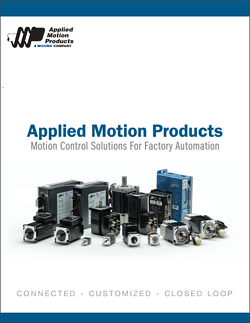 Applied Motion Products specializes in high-precision, cost-effective motion control products. They offer a full complement of stepper and servo, drives, motors, controllers, gearheads, and power supplies to serve a diverse industrial and OEM customer base. They offers a powerful range of standard products to meet your motion control requirements. If your application demands something unusual or unique, we can engineer a design to optimize the product’s performance for your needs. This ability to offer customized products often results in improved productivity and higher reliability for our customers, often while reducing costs. StepSERVO Drives are the closed-loop versions of our well established, high performance, microstepping step motor drives. By incorporating closed-loop servo control algorithms in these drives and pairing them with StepSERVO Motors with high resolution encoders, we are able to create StepSERVO systems with performance that greatly exceeds conventional step motor performance. Peak torques as much as 50% higher, smoother, quieter operation and lower power consumption are just some of the benefits of StepSERVO Drive and Motor systems. 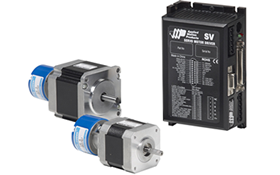 StepSERVO Motors are specifically designed to be paired with our StepSERVO Drives to create motor and drive combinations that outperform traditional step motor systems. Each StepSERVO Motor is a premium, two-phase, hybrid step motor built with an integral high resolution feedback device. The performance gains achieved when using a StepSERVO Motor in combination with one of our StepSERVO drives include high peak torque ranges for faster acceleration and greater machine throughput, as well as quieter operation and less power consumption. STM integrated drive+motors fuse step motor and drive components into a single device. These integrated steppers offer a space-saving design that reduces wiring and saves on cost over separate motor and drive components. 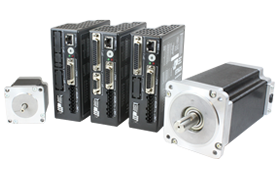 STM integrated steppers, in NEMA 17, 23, and 24 frame sizes, combine the best of Applied Motion’s drive and motor offering in a single, integrated device. Step motor drives from Applied Motion Products offer unparalleled performance for today's modern machine builders. From the ground up these drives offer best-in-class current control for optimal smoothness and torque, robust and flexible on-board control options, and industry-standard industrial network communications. Since 1978, Applied Motion Products has specialized in offering two-phase, hybrid step motors in a variety of frame sizes. These motors are designed to work optimally with Applied Motion stepper drives, ensuring smooth motion and high performance in every application. Add an encoder to the rear shaft of an Applied Motion step motor, marry it to an Applied Motion drive equipped with encoder-feedback functionality, and dramatically improve system performance. Full-featured servo drives in a variety of control options ranging from pulse & direction, analog torque/velocity and streaming serial commands, to the stand-alone execution of stored programs using your choice of two popular programming environments: Si Programmer™ and Q Programmer™. An easy-to-use software interface, Quick Tuner™, makes setup and tuning the servo system a snap. 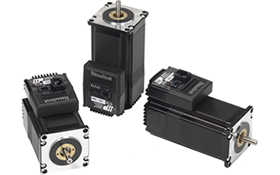 High-torque brushless servo motors in NEMA and metric frame sizes. J series motors come in a 40, 60, or 80 mm frame size, along with a 10,000 count incremental commutating encoder and an IP65 rating for the motor body. 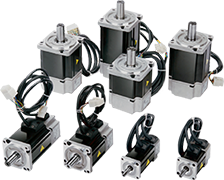 V series motors come in NEMA 17, 23, and 34 frame sizes with 2048-line incremental commutating encoders. 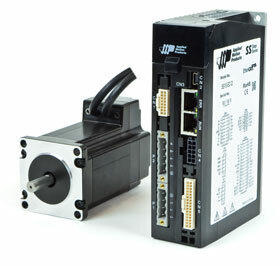 The servo motors available here are specifically designed to work with Applied Motion servo drives. Interested in an Applied Motion Product? Find all of Applied's videos on their YouTube Channel. Applied Motion Application? Contact Us!